We want to be a church for all generations. Children are a natural part of our congregation and worship services. We want the children to have a place, to participate in worship with us adults while also engaging in activities that suit their needs. Children are therefore present during the beginning of the worship service before going to Kids for their own Bible study, music, crafts and games. The children follow a thought-out lesson plan in order to receive the central message of the Gospel in the Bible stories in a way that they can understand. 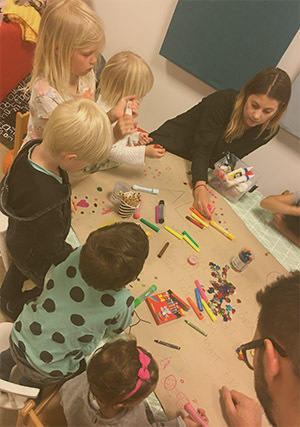 The children are always engaged in a discussion about the Bible texts and the crafts are often connected to what is being discussed. There is always a snack-time with fruit in the middle of the meeting. Kids ends when the adult service ends, at which point everybody meets up for coffee and fellowship.